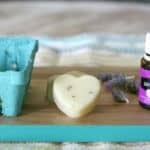 I love these DIY Lotion Bars to use while traveling or on the go when I need to moisturize my skin. 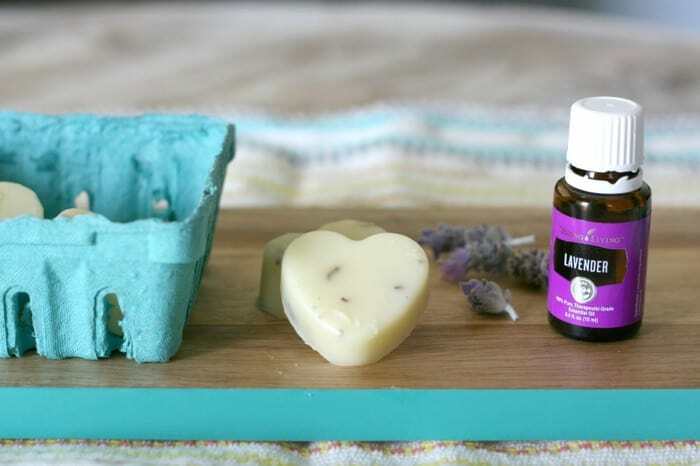 Learn how to make these homemade lotion bars. Do you ever feel like you’re always on the go? With three kids, I feel like we are constantly driving to/from school, afterschool activities, family-fun outings, or just on the road to visit friends and family. With all that travel, you bet I need something to keep my skin (as well as my kids’ skin) moisturized because it gets so dry here in California. That’s why I wanted to find a way to take my homemade body butter on the go, but without the mess. So I came up with a super simple way to do it – add beeswax! Ta-da! Yep, it’s just that easy. I made DIY Lotion Bars using my homemade body butter recipe and added beeswax to it. It took me a while to figure out the right ratio, but I’ve got it down now and wanted to share it with you. So if you’re planning a trip or just always on the go, you can take these DIY Lotion Bars with you. These make adorable gifts for birthday parties (um, anyone thinking a DIY beauty-themed party for little girls? ), holiday gifts, etc. I just made a bunch to give to my family and friends. The best part is that these lotion bars are so inexpensive to make – just a little over 3 bucks to make a 1 oz bar (including the cost of the container). Compare that to the lotion bars in department stores that retail for $12-20 per 0.5 oz bar! So you get DOUBLE the lotion bar at about 1/6 of the price? Yep, and I’ll show you how to do it. Once the lotion bars have solidified, you can rub them anywhere you need to moisturize – such as elbows, knees, arms, legs, etc. These DIY lotion bars are so gentle you can use them on babies and kids too. Did you make these DIY Lotion Bars? Don’t forget to rate them and comment below to let me know how it went. You can also FOLLOW ME on Facebook, Instagram and Pinterest to see what other fun things I’m getting up to. How to make DIY lotion bars that are full of natural ingredients and great for your skin! Remove from heat once all ingredients have melted, and add essential oils. Fill silicone molds or tin containers (I really like these) and let cool for a couple of hours to firm up. Coconut oil is great for dry, scaly or itchy skin. It helps to naturally moisturize. Shea butter is derived from the nuts of the shea tree, grown in Africa. It’s incredibly moisturizing and can help to protect skin from dryness. Beeswax is moisturizing and helps to keep this DIY Lotion Bar in a solid form that makes it easy to travel. Vitamin E is nourishing for the skin. It also helps to fight off free radicals and gives the skin a youthful appearance. Lavender and Geranium essential oils (where to buy) are fantastic for the skin. Both help to protect and soothe the skin. These sound great, I had never even heard of lotion “bars”. SO why are most of the ingredients crossed out now!??? Please update/explain. I’m new to essential oils and DIY natural remedies and cleaners. I’m proud to say that I’ve made some great smelling and highly effective air fresheners, laundry and carpet cleaners and hand sanitizers so far! My next project is to make my own lotions. I already own everything in your ingredients list except for the beeswax. Which I’ll then use to make these lotion bars and my own lip balms!! I’m so excited to try this recipe!!! Yeah! Good luck! This lotion bar recipe is really easy. I think you’ll really like them.